Perfect for a zombie costume! 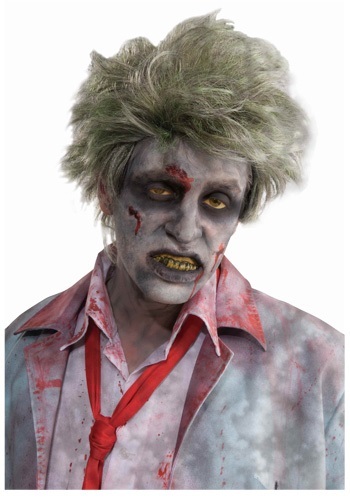 For a look that screams, “fresh out of the grave” you could either dig up a body and parade it around for Halloween or...consider this Grave Zombie Wig. Good choice. This way, when the impending zombie apocalypse happens, you won’t have to spend hours considering if you should join the the living dead. You already look like you belong, perfectly! This wig will give others the impression that you've joined the side of the damned without the fuss of having to die, eat flesh, and scare your friends and family! However, we have to state (for legal purposes) that should a zombie apocalypse actually happen, we advise you to stay in a safe, well stocked place. Seriously this wig will not protect you; but it won’t protect your loved ones from a good scare this Halloween, either.